I haven't been around here in a long time and honestly, I haven't really even had time to read blogs in a while. I finally logged onto feedly and started reading and before I knew it, I was dying to get back to seeing what everyone is up to. While I always knit, at times, I sometimes forget how much fun it can be to plan and buy yarn and browse patterns. 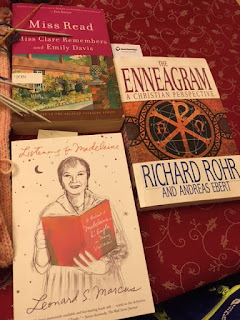 Thank you, Ginny, for hosting the marvelous Yarn Along! My needles are frantically trying to get ready for Christmas. The peach is a wrap for the DECE who I share a classroom with. You can't necessarily see but it's a hand-dyed yarn and it's very pretty. I am the queen of cables and this seemed like a good pattern for working in the car and not having to pay close attention. It's almost ready to be off the needles and blocked. I'm hoping to get it finished this week. The pattern is Grandma's Wrap and it's simple and is looking very pretty. I'm making it longer than the pattern calls for. The other knitting bit is for a pair of fingerless gloves for Pk's riding teacher. Fingerless gloves are wonderful for the barn and can go overtop of riding gloves. I want to make a pair for Pk but right now, I needed something lovely for her teacher for Christmas. It's with sock yarn and a bit finicky but I love the way the yarn is stripping up. 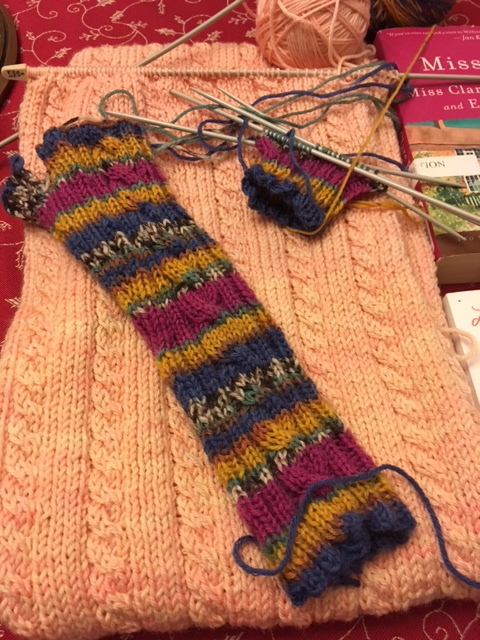 Sock yarn is so much fun! In terms of reading, as always, I have several books on the go. I have recently discovered the Enneagram and it has really interested me. I won't lie, at first I dismissed it as being some kind of new age something that didn't interest me at all but when several of my favourite Christian authors were very enthusiastic, I became interested. The Rohr/Ebert book is the one most often reference so I decided to start with that. It's interesting and it's challenging to try to see myself. I think I might be a three with a two wing but I'm still trying to figure that out. 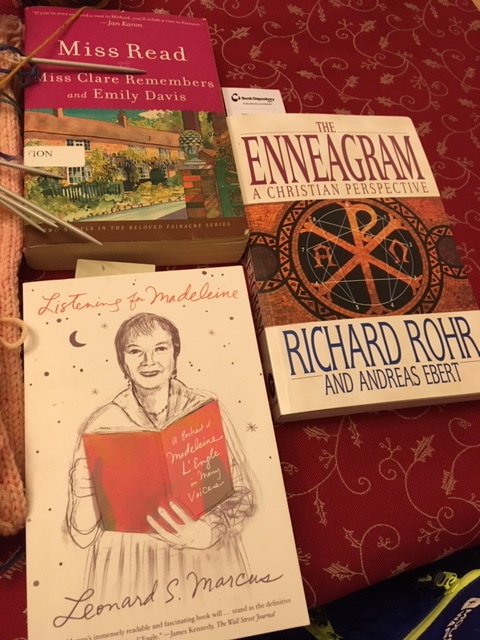 I adore Madeleine L'Engle and when my VERY VERY VERY favourite podcast in the world referred to something related to her that I haven't read, I had to get my hands on it. If you are reader and you haven't listened to What Should I Read Next, you are missing a true pleasure. It's by Anne Bogel, the woman behind the Modern Mrs. Darcy website and in each episode, she interviews someone with an interesting connection to books. She asks for three books they love, one they hate and what they are currently reading and then makes three book suggestions. It's marvelous but your want-to-read list will expand by leaps and bounds. Finally, I am continuing to meander through the Miss Read Fairacre books. They are the ultimate in comfort reading and I am currently reading Emily Davis. If you love cozy villages, real life and a world in which nothing is perfect but people are usually decent and kind, you will love these. Miss Read also wrote to series, Fairace and Thrush Green, and each series has a significant number of books. They are lots of fun! I can't wait to check out what everyone else is up to!